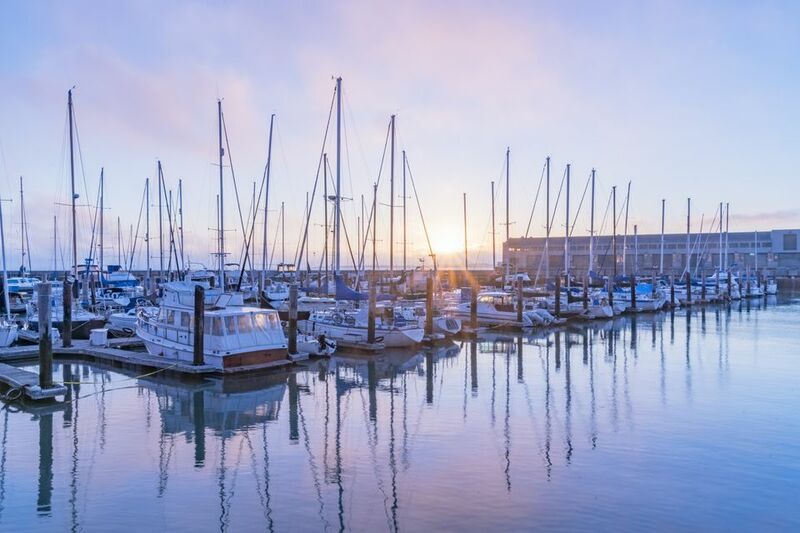 Formed in the early 20th century as a result of the city's devastating 1906 earthquake, San Francisco's Marina District is a picturesque neighborhood of Art Deco structures and pastel-colored homes built atop rubble and marshlands. Its prime waterfront location makes it a popular base for the well-off and young families, though it's got plenty to attract visitors too — including a slew of top bars and restaurants, ample retail shopping, and bayside views for days. The Marina District first made its mark when organizers selected it as the site of the 1915 Panama-Pacific International Exposition, a World's Fair designed to celebrate the completion of the Panama Canal, but whose underlying mission was to showcase how far San Francisco had come since its catastrophic earthquake several years earlier. One of the fair's many structures was Bernard Maybeck's Palace of Fine Arts, which is the only building from that event which remains in its original location. The Palace is a stunning architectural beauty: a European-style pergola built around a central rotunda and perched alongside a small, manmade lake. It's decorated with massive female sculptures — 26 in total — who were created to “guard” this work of art. Although the Exploratorium moved from the Palace to San Francisco's Embarcadero in 2013, it still hosts plenty of great performances in its onsite theater, and remains the perfect spot for wedding pics and lingering afternoon picnics. The Marina Green is just that: a large swath of greenery that stretches between Fort Mason to the east and the Presidio to the west along San Francisco Bay. It was once a U.S. Post Office Department airfield, though today offers prime public views of both Alcatraz and the Golden Gate Bridge, and is home to a small craft harbor that looks straight out of the Gilligan's Island intro. While it's an ideal park for flying kites, sunbathing, or playing volleyball, the Marina Green also boasts a couple of onsite attractions. There's the water-activated Wave Organ, an acoustic sculpture crafted of 25 PVC and concrete organ pipes that creates memorizing sounds with the changing tides; and the Marina Green Fitness Court, a seven-station public circuit-training system that's made specifically for outdoor workouts. The Marina Green is also a premier spot for catching the Blue Angels flight demo squadron perform their death-defying feats during the city's annual Fleet Week each October. Built as a U.S. Army military complex, the 13-acre Fort Mason is now a center of arts and culture that's home to cool cafes, unique cultural museums, and endless events spanning everything from Eat Drink SF to the Renegade Craft Fair. Soak in spectacular bay views outdoors, catch an interactive comedy show with Bats Improv, or enroll in an art class: Fort Mason hosts SF City College courses in everything from printmaking to ceramics. It's also where you'll find some of the city's most innovative non-profits, including the Long Now Foundation, whose Interval cafe-bar-museum is a TripSavvy favorite. Fort Mason also plays host to a Sunday morning farmers market, which is sponsored by the Golden Gate National Park Service. More than 35 vendors showcase their farm-fresh wares, every Sunday 9:30 a.m. to 1:30 p.m. year-round in the center's parking lot, including seasonal produce, organic cherries, and tomatoes, locally grown nuts, and plenty of breakfast items. Purchase your goods first, then spend some time enjoying the surrounding scenery as you snack. With so much excellent retail, shopping is a Marina District trademark and Chestnut Street is its hub. From Divisadero Street to Fillmore Street, you'll find everything from William-Sonoma to Fleet Street Sports, with stores like Urban Outfitters dotting the outer streets. Shop for stylish eyewear, browse the selection of reads at Books Inc., or stop by a local boutique like Toss Designs for fabulous handbags and pajama sets, then take a break at one of the stretch's numerous cafes or coffee shops for a bit. Nearby Union Street is as equally as buzzing, though many San Franciscans consider that more a part of Cow Hollow than the Marina neighborhood. Right on the cusp of the Marina and the Presidio sits a massive Sports Basement, your one-stop-shop for camping, cycling, and all-weather outdoor gear. San Francisco's largest gathering of food trucks and mobile food stations takes place Friday evenings from March through October in the Fort Mason parking lot, complete with more than 30 culinary vendors and craft beer, wine and cocktails for sale. Sample various foods while enjoying the sounds of live music and DJ spins, people-watch from a central beer garden, and enjoy the beauty of bayside surrounds at this popular end-of-the-week event, which also happens to be the largest of its kind in the U.S. It's authentic San Francisco street food at its best. The Marina happens to be home to some of the city's finest restaurants: legendary spots like Greens, a landmark vegetarian restaurant located within (where else?) Fort Mason and offering breathtaking panoramic views; A16, a classy southern Italian eatery known for its fine-tuned pizzas, rustic fare, and excellent wines; and the incredible Atelier Crenn — a modern French restaurant on the cusp of the Marina and Cow Hollow where Chef Dominique Crenn, the only female chef in the U.S. to have received three Michelin stars, creates a poetic menu of pure magic. The dishes here are as picture-perfect as they are delicious. Meals consist of a multi-course tasting menu and are pricey, but consider it a night out that's worth every penny. Unlike the bulk of San Francisco, the Marina District is flat — a boon for casual cyclists, who are more interested in taking in the surrounding scenery than tackling the city's notorious hills. There are several bike rental spots along Lombard Street, as well as Fort Mason's Parkwide Bike Rentals, which also offers guided tours over the Golden Gate Bridge to Sausalito, through Golden Gate Park, and on motor-assisted electric bikes across SF. The Bay Trail connects Fisherman's Wharf to the Presidio's Crissy Field by way of the Marina, offering unbeatable views of the Golden Gate Bridge heading west. Immortalized by local author Armistead Maupin in his Tales of the City, which the New York Times Book Review once called “An extended love letter to a magical San Francisco,” the Marina Safeway remains one of the most notable places in the city for picking up singles. That's single men and women, not slices of cheese or boxes of cereal as you might expect from a neighborhood supermarket. Long known as “Dateway,” the legendary meeting place stocks its shelves with plenty of delectable goods just like any other grocery store for you to peruse while also searching for a date.